Werner Herzog's masterful film The Engima of Kaspar Hauser tells a historical true story about a young man barely able to speak and walk, who mysteriously appeared in town square early one morning during the year 1828 in Nuremberg, Germany. The townspeople found him clutching the Bible in one hand and an anonymous letter in the other which explained that he had been held captive in a dungeon his entire life, and only recently was he released, for reasons unknown. After the townspeople exhibit him in a sideshow attraction, this strange young man is taken in and studied by a psychologist, who tries to educate and civilize him, and throughout the years this man will learn to read, write, and even play the piano. Herzog slightly blurs the line between what is fact and what is fiction, and he seems to care less about the accuracy of the story itself and more about the transcendent power of it's images. The story is not so much a linear screenplay but a series of striking dream-like behaviors and images which act on the emotional core of the mentally challenged character of Kasper, and of the strange offbeat character's that seem to inhabit the town of Nuremberg. These dream like sequences that at first might seem unrelated to Kaspar in fact reflect his emotional struggles on perfecting the teachings of 19th Century German high-society customs and manners. The striking images that Herzog presents to us, like a desert caravan led by a blind man, a stork getting eaten by a worm, or a line of penitents struggling up a hillside, are the exact pieces in a puzzle that are needed to solve the mystery of this ambiguous stranger; even if we know the mystery is in itself unsolvable. What makes The Enigma of Kaspar Hauser such an intriguing and enriching experience is Kaspar's increased intellectual development which brings into play questions of language, growth and education and how it can shape our thoughts and feelings as we grow as a person. Kaspar's sudden intellectual discoveries on 19th Century German customs has him discover just how absurd and preposterous many of them really are, which leads to many fascinating moments. 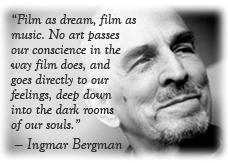 The acting in a Werner Herzog film film isn't what Herzog traditionally looks for when looking for an actor. The actors he chooses for his roles have to be able to embody the essence of the character along with creating a form of visual intensity, whether if its actor Klaus Kinski or the sudden discovery of non-actor Bruno Schleinstein. Bruno was born the son of a prostitute and unfortunately spent much of his youth in a mental institution. He was largely a self-taught musician, who over the years developed considerable skill on the piano, and accordion, while sustaining himself financially working as a forklift driver. When Bruno first caught Herzog's attention, Herzog knew immediately this young man embodied the exact qualities for the character of Kaspar Hauser, and because of that made The Enigma of Kaspar Hauser one of the most fascinating character studies in all of film history. In a dream like sequence with the opening scene it shows a man in a rowboat and a little girl looking inside the water. The camera drifts down the lake towards an elderly woman washing her clothes. "One Sunday in 1828 a ragged boy was found abandoned in the town of N. He could hardly walk and spoke but one sentence. Later, he told of being locked in a dark cellar from birth. He had never seen another human being, a tree, a house before. To this day no one knows where he came from...or who set him free." Another sequence shows us a painterly cornfield beautifully billowing in the wind, with the beautiful music of Pachelbel Canon on the sound-track. Superimposed is a quotation from Lenz, the tale of another tragic figure. "But can you not hear the dreadful screaming all around that people usually call silence?" A chained prisoner in a tiny cellar named Kaspar Hauser is playing with a wooden horse which seems to be the only object to occupy his time. A mysterious man in a black overcoat and top hat comes in and sets out a small stool guiding Kaspar’s hand to write on a piece a paper : “Remember that if you write nice now papa'll give you nice horsey." When Kaspar gets off track and stops to write, the man punishes him by batting him across the arm with a form of baton. One day, in 1828, the same man returns one again to the dark cellar and picks up Kaspar and begins to dress him. He then lunges him over his shoulder and carries him outside the cellar and up upon the top of a hill. The man lets Kasper off his back and forces him to start walking by pushing his legs. The man says to Kasper, "Repeat after me: I want to be a gallant rider like my father was before me. Remember that." When darkness arrives the two rest. At dawn the man lures Kasper in the middle of town square in Nuremburg forcing Kaspar to stand straight up and hold out a letter in the middle of the street. "Wait here. Wait for me here!" The mysterious man runs away into the darkness stranding Hauser there holding the letter with a bewildered look on his face. Villagers start opening their windows and leaning outside in the early morning to look at this mysterious stranger in the street. A villager walks out and asks Hauser what he wants there. Hauser says, "Horsey! Like my father was before me!" The villager looks at the letter which says, "To the Cavalry Captain of the Fourth Squadron...Sixth Schwolische Regiment." The villager then informs Hauser the directions to the Captain's house. The villager politely takes Kaspar to the Captain's home but when the Captain is not there at that time Kaspar is told to be kept in the barn until he returns. When the Captain finally returns home he orders Hiltel the prison guard to inspect Kaspar and read the letter Kasper attended to give him. When being read, the Registrar is along side Hiltel recording and correctly translating the words in writing so he can add them to the town records. Hiltel reads: (mispells and all) "From the Bavarian border, no place name, dated 1828...'His Excellency the Captain.' This here bouye wants to serve his King faithfully. The bouye was laid me on...I am a poor laborer with 10 children...and have enough to do to feed myself and my wife. His mother wanted to raise the boy, but I couldn't ask her to. I didn't tell her the boy was laid on me by the Court. I have not let him take one step out of the house since 1812...so nobody doesn't know a thing about him. I teached him reading and writing and he wants to be a gallant rider like his father before him...If he had parents he would have been a smart fellow. You only have to show him something and he can do it. I brought him away by night. I am not signing my name." The Captain and several of the Royal Police ask Kaspar basic questions on who he is but he doesn't seem to give an answer. Hiltel says, "The intelligence of this man is in a state of absolute confusion." They try to feed him but all he does is spit out the food, and so they hold him down and do a body inspection on his feet and arms noticing several bruising on his upper arm. They also find a prayer book in his hands and a folded paper which contains a small quantity of gold leaves which is very mysterious. They have him try to write something on a blank piece of paper and the only thing Kaspar writes is his name Kaspar Hauser. They decide to incarcerate Kaspar that evening within the tower along with criminals and vagabonds. "The fellow is not as wild as I thought: he came peacefully. He seems harmless enough," Hiltel says. Hiltel eventually decides to invite Kaspar to live with him and his family since he sees that Kaspar doesn’t look to be mad or depraved. During breakfast Hiltel and his wife try to seat Kasper up straight at the kitchen table as Hiltel says to his family, "I guess he never sat up at a table before." Hiltel breaks free Kaspar’s tight grasp that he has on his hat, and when Kaspar is given proper food, he seems to just spit it out. During breakfast Hiltel teaches Kaspar the difference between an empty cup and a full cup and the difference of its context. Hiltel and his family become very generous to Kaspar, as his wife baths him frequently with Kaspar saying, “Mother, my skin is falling off.” The children also give him teaching lessons on the different parts of the human body. The townspeople arrive and treat Kaspar as a sort of exhibit trying out new social experiments to see how Kaspar would react to them. When they bring in fire and wave it in front of Kaspar’s eyes he doesn’t seem to flinch or make any sudden movements. "He's got no conception of danger. It didn't even scare him,” Hiltel says. When Kaspar sees the candle flame he decides to put his fingers on the flame and keep it there for several moments. When it burns him he finally reacts to that feeling and starts to cry. In one odd scene a group of villagers bring in a chicken and seem to hypnotise the chicken, which greatly frightens Kaspar. Fascinated by a rocking baby, Hiltel’s wife lets Kaspar hold their baby. He starts to tear up and says, "Mother, I am so far away from everything." The townspeople realize that Kaspar is becoming a burden on the community and is costing them money to shelter and feed him. Because of that the village decides to use him as a carnival attraction, so Kaspar can repay some of the fees from the town. When the festival opens the Circus Director brings in a crowd as he presents his exhibit of colorful character's saying, "Come right up ladies and gentlemen! Parents keep an eye on their children! Now before we present the Four Riddles of the Spheres...we have for you an entertaining intermezzo.!" He presents a bear, and a man who can play with fire. "And now ladies and gentlemen...for the very first time in the history of the world. Brought together for you and only for the first time: Minors please keep your distance. The gravity of my presentation permits of no childish pranks. And now for the first Riddle: The little King." He pulls a curtain back to show a little dwarf dressed as a king sitting on a large throne. "Our next Riddle of Science...the Young Mozart!" A dwarf in a Mozart uniform is then presented. "Our next Riddle, a living specimen of anthropology...is Hembrecito. An untamed Indian from the sunny shores of New Spain." This attraction plays his music from a wooden flute as the legend is that if he ever stops playing, the village will die. "And now to the final and greatest riddle of all! Kaspar, the foundling! He has agreed with the express permission of the authorities...to appear in person here every afternoon, and thus...to ease the communities financial burden. Thank you, Kaspar! His origin remains in darkness to this day, ladies and gentlemen. Is he a prince? Or possibly the legitimate son of Napoleon? His is and will remain the Riddle of the European Continent!" A Professor named Daumer is in the crowd as he watches this side show. Sometime after the show the sideshow performers try and run from their owners as they try their best from escaping outside of the town, with the Indian hiding up in a tree. The Professor finds Kaspar hiding in a bee hive barn as Kaspar says, "I want to fly like a rider...midst the bloody tussle of war!" The side show attractions are than rounded up and brought back into town. 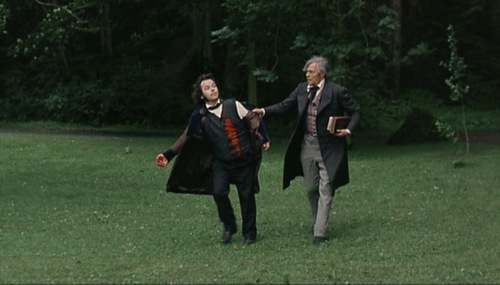 The Professor decides to rescue Kaspar Hauser and take him patiently attempting to transform him. After two years Kaspar has learned to read and write, and develop unorthodox approaches to logic and religion; but it is music which pleases him most. While listening to a song being played on the piano by Florian, another young protégé of The Professor’s, Kaspar turns to The Professor and says, "The music feels strong in my heart. I feel so unexpectedly old." The Professor says, "You've been such a short time in the world, Kaspar." Kaspar asks, "Why is everything so hard for me? Why can't I play the piano like I can breathe?" The Professor says, "In the two short years you have been here with me...you have learned so much! The people here want to help you make up for the lost time." Kasper says, "The people are like wolves to me!" The Professor says, "No, you mustn't say that. Look at Florian, he lives here too. He lost his family in a fire, he is blind, but does he complain? No, he plays the piano the whole day long...even though his music sounds a little strange." During one morning Kaspar and The Professor go apple picking and Kaspar learns how apples turn colors over their short period of life. When The Professor tries to have Kaspar understand that an apple doesn’t have lives of their own and will only follow human’s will, The Professor demonstrates by rolling an apple down a path to show it will stop where he wants the apple to stop. Kaspar says, “The apple didn't stop, it hid in the grass!” And when one doesn't stop and hops over his foot, Kaspar calls the apple a smart apple. At lunch Kaspar asks the professor's housekeeper Katy several wise questions that focus on a woman’s domestic position. "What are women good for? Can you tell me that, Katy? Women are not good for anything but sitting still! Why are women allowed only to knit and cook?" Instead of answering the question Katy smiles that tells Kaspar to ask Mr. Daumer that question instead because he’ll have a decent answer for him. One day Kaspar took some cress seeds and sowed his name with them in the Professor's garden. When someone walked through the garden and stepped on them Kaspar cried for a long while having to replant them again. (During that scene there is a powerful sequence which shows a stork eating a helpless frog). The Professor joins Kaspar in the garden and the two of them have a discussion about dreams. Kaspar in the beginning of his teachings used to believe his dreams were real but has grown to realize they were no longer were. The Professor asks him, "Strange that you didn't dream once during your years in prison!" Hauser says, "I dreamed of the Caucasus." There’s a beautiful dream like sequence that is shot 8mm in Burma, which includes several shots of temples and mountains, which reinforces the mysterious of Kaspar and of the dreams he has. The Professor cannot believe that Hauser believes it's true that his bed is the only place in the world he is really happy in. The Professor asks him, "Don't you like the garden? The gooseberry bushes? Or the onions over there? All so green." Hauser says, "Well, it seems to me that my coming into this world...was a terribly hard fall!" One Logic Professor arrives into town and along with Katy decides to test Kaspar and ask him a complex question: "Kaspar...Let’s pretend that this is a village. In this village live people who only tell the truth. Here is another village. The people here only tell lies. Two paths run from these villages to where you are standing...and you are at the crossroads. A man comes along, and you want to know which village he comes from...the village of the truth tellers or the village of the liars. Now in order to solve this logically, you have one question, and only one. What is the question? I admit, the question is thorny. If you ask the man whether he comes from the village of truth...and he does, then he will say, truthfully, yes. But if he comes from the village of lies, he will lie...and also answer yes! Yet there exists one question which will solve the problem. You have one question, Kaspar. and only one, to solve this problem of logic. If you can't think of the question...then I will tell you. If you came from the other village, would you answer 'no' if I were to ask you whether you came from the liar's village? By means of a double negative the liar is forced to tell the truth. This construction forces him to reveal his identity, you see. That's what I call logic via argument to the truth!" Kaspar doesn't understand the concept and even Katy admits she wouldn’t know the answer to that question either. Kaspar does say he knows though of another question. "I should ask the man whether he was a tree-frog. The man from the village would say: No, I'm not a tree-frog because he tells the truth. The man from the liars' village would say: Yes, I'm a tree-frog because he would tell a lie. So I know where he comes from." The Professor doesn’t believe that is a not a proper question (even though Katy understands Kaspar's metaphor) "I can't accept it as a question. That's no logic; logic is deduction, not description. What you've done is describe something, not deduce it. Understanding is secondary; the reasoning is the thing. In Logic and Mathematics we do not understand things...we reason and deduce: I cannot accept that question." The Professor informs Kaspar that an English Nobleman named Count Stanhope has arrived in town and has taking great interest in adopting Kaspar if he makes a good impression on him. The Professor says, "It would be a wonderful new start for you Kaspar." When arriving at a ball with several high society people Count Stanhope brings Kaspar as his young protégé, and introduces him to several guests while gossipy women whisper, "Isn't he droll? Quite the noble savage. "Kaspar shakes the hand of the mayor and his wife and when asked by the Mayor’s wife how it was living in that dark cellar, Kaspar says, "Better than outside." Count Stanhope says, "But we all like you so much Kaspar." Kaspar says, "Your Grace, nothing lives in me except my life!" Count Stanhope says, "Oh no, there's much more alive inside of you. You've been making such fine progress with your music...something that educates and ennobles our feelings!" Kaspar asks his Grace if he may play Mozart’s the waltz on the piano, but during midway through Kaspar asks if he can be excused because of not feeling well. Later in the party Count Stanhope’s story of his trip to Greece is interrupted. Kaspar seemed to excuse himself into another room and is sitting down knitting and Count Stanhope says, "I'm sure I don't understand. And what manner of silly business is this? Apparently I am guilty of misjudgment. There hasn't been enough time...for me to get a true picture of the circumstances." During a church ceremony Kaspar unexpectedly runs outside fleeing the church with the Professor chasing from behind. The Professor asks him why he chose to run out of the church and Kaspar says, "The singing of the congregation...sounds to me like awful howling. And then the singing stops, the pastor starts to howl." One day Kasper is out in the Professor’s garden and steps in the cellar to eat a plant from the garden, when suddenly the mysterious man with the black overcoat and top hat emerges in front of him and tries to end his life with a hatchet. When arriving home The Professor and Katy immediately see a blood trail and follow it outside and inside the cellar. They enter the cellar and come upon a bloody and unconscious Kaspar and immediately carry him up into the bedroom and call the town doctor. Kaspar recovers as he again spends time outdoors with nature and plays music on the piano. One afternoon while the Professor reads in the Garden Kasper runs up to him as he has been attacked once again, this time stabbed in the stomach by the mysterious man in the black overcoat and top hat. Kasper tells him, "The man told me to watch the gardener...then he gave me this pouch and stabbed me.” The Professor looks to see what was in the pouch and he finds a note which reads: "Hauser can tell you exactly what I look like...and where I come from. To save him the trouble...I'll tell you myself where I come from...and even what my name is. M.L.O." On Kasper's death bed friends and loved ones are alongside him and the priest reads a biblical passage. Afterwards he asks Kaspar, "If anything is burdening you, please tell us now." Kaspar says, "Yes. There is something, a story...It's about a caravan...and the desert. But I know only the beginning." The Priest tells him to still go on with the story, even if it’s only the beginning. Kaspar says, "I see a caravan coming through the desert...across the sands. And this caravan is led by an old Berber tribe’s man. And this old man is blind." While Kaspar describes this story videos of men are crossing the desert on donkeys. "Now the caravan stops...because some believe they are lost...and because they see mountains ahead of them. They look at their compass, but it's no use. Then their blind leader picks up a handful of sand...and tastes it as though it were food. My sons, the blind man says, you are wrong. Those are not mountains you see...it is only your imagination. We must continue northward. And they follow the old man's advice...and finally reach the City in the North. And that's where the story begins. But how the story goes after they reach the city, I don't know. Thank you all for listening to me. I'm tired now.” Right after Kaspar dies you nothing but silence and the light hum from Florian humming a song quietly. After the death of Kaspar Hauser, an autopsy was done on his brain as doctors realize afterwards there is an abnormality of his left cerebral hemisphere, and the doctor’s record the findings. The Registrar gets the medical report and when leaving the hospital decides to walk home as he says, "What a wonderful, precise report this will make! Deformities discovered in Kaspar Hauser's brain and liver! Finally we have got an explanation for this strange man... and no one would never find nothing like this." Like legendary director Stanley Kubrick, Werner Herzog has been known to be one of the most visionary and creative directors who took big artistic risks not only with his film projects he envisioned but of the unusual cast of character's he hired for his films. Bruno Schleinstein was born in an abusive childhood and spent 23 years of his life in a mental institution. He was a self-taught musician, who over the years developed considerable skill on the piano, and accordion and would play in back gardens performing 18th and 19th century style ballads at the weekends, while sustaining himself financially working as a forklift driver at a car plant. Bruno was spotted by director Werner Herzog in the documentary Bruno der Schwarze – Es blies ein Jäger wohl in sein Horn and Herzog promptly casted Bruno as his lead actor in The Enigma of Kaspar Hauser. Because Bruno didn't want to become a known actor and celebrity Herzog agreed to keep Bruno's last name confidential which is why he is credited in the film under the name of Bruno S. Even though Bruno had no previous acting expierience and the historical figure he was portraying was only in his teens, Herzog knew that Bruno was perfect for the role of Kaspar and decided to use him again in Stroszek in 1977. During the filmmaking of The Enigma of Kaspar HauserHerzog had claimed that Bruno was deeply suspicious of the director, and nervous of performing in front of the cameras and so he had to be listened to for several hours on set in order to build his self-esteem. One of Herzog's fascinating character studies is a small film titled Stroszek, which is about a man released from prison and with a friend and prostitute leave Germany and come to America. Bruno Schleinstein also stars in the lead role in which Herzog wrote especially for him. The character of Stroszek not only has a number of biographical details from Bruno's life, including the use of his own flat as the home of Bruno Stroszek but Bruno also was allowed to play his own instruments for the context of the story. Herzog is one of the few director's whose 'making of' a film becomes more legendary than the film itself. Besides Bruno S, German actor Klaus Kinski was another Herzog regular among his cast of actor's throughout his films. And like the fascinating stories that Bruno S. developed with Herzog in his character pieces Stroszek and The Enigma of Kaspar Hauser; Kinski was another fascination all together. Herzog had a love and hate relationship with Kinski and yet the both of them seemed to make some of Germany's greatest films together. Herzog casted Kinski to play Dracula in a remake of F.W. Murnau 1922 silent expressionistic classic Nosferatu which was a personal favorite of Herzog's; the director even used the same locations as Murnau originally had. Herzog then created one of his riskiest and largely scaled epics titled Fitzcarraldo which also starred Kinski. It was a risky and complicated project for Herzog, as he shot the film in the rain forest and also involved an impossible task of men physically moving a steamship from one river to another by dragging it across land. Of course Herzog literally dragged a real ship across land to make the film, despite urgent warnings by engineers that the cables would snap and slice everyone in half. Then finally there is Herzog's masterpiece Aguirre: The Wrath of God which is not only considered one of the greatest films in the world, but also one of the major contributions to the New German Movement. This film stars Klaus Kinski as a ruthless and insane leader named Aguirre during the 16th century leading a Spanish expedition in search of the golds of El Dorado. Aguirre is a masterpiece that explores the dark depths of the human soul and exposes the themes of greed and madness; and was also an inspiration for Frances Ford Coppola's Apocalypse Now. The Enigma of Kaspar Hauser is one of Herzog's most fascinating and mysterious films. The simple and yet perfect casting of non-actor Bruno S as the strange and bizarre character of Kaspar Hauser was a perfect match because Bruno had always been known to be strange and child like; much similar to the character he was playing. Herzog describes Bruno as "the unknown soldier of the cinema," as most of Bruno's acting wasn't necessarily acting but him just reacting to what Herzog told him to do in front of the camera.The scenes in which Bruno looks straight at the camera with a confused and bewildered expression on his face cannot be easily matched, because it is done so naturally and effortless that no phony professional actor could ever imitate. They're are also touching moments of Kaspar feeling different forms of emotions, whether it's pain when resting his finger on a candle light flame, or love when he cradles a woman's baby. 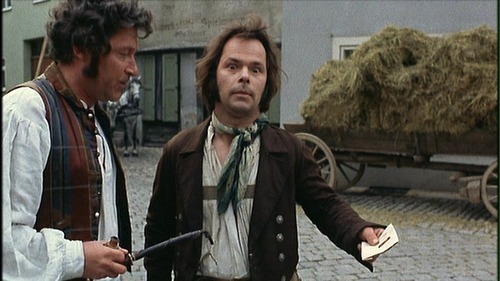 It was said that Bruno got very attached to the role of Kaspar Hauser because of the character's similar characteristics which is exactly why Herzog wanted him in the first place. On the commentary track of the DVD of Enigma of Kaspar Hauser Herzog states that he was vilified in Germany for taking advantage of the unfortunate, (Like his interesting portrayal of supporting character's, like dwarfs, or the mentally and physically disabled) and yet if you closely at Bruno's subtle expressions, you can suggest that in a way Bruno was taking advantage of Herzog. Within all of Herzog's films they're actors who embody extraordinary qualities, qualities that Herzog felt the need to project within the lens of the camera, and Bruno S. was one of these actors. The Enigma of Kaspar Hauser's German title originally translates as, "Every Man for Himself and God Against All." Interestingly enough that seemed to sum up Kaspar's thoughts and feelings on human's and their nature, with the more he learned of human's cruel and selfish ways. The Enigma of Kaspar Hauser has been compared to Frances Truffaut's The Wild Child and David Lynch's The Elephant Man which tell similar stories in which an outsider is not accepted by society. 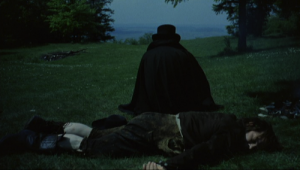 Also similar to The Enigma of Kaspar Hauser, both films involve a psychologist who kindly reaches out to try and civilize them, but in the long run they either cannot change their essential nature, or they are destroyed by the public's ignorant fears and prejudices. The Enigma of Kaspar Hauser has a series of dream like landscapes throughout the context of its story. Its transcendent music and its beautiful shots of nature, embody all the dreams that Kaspar inspires on having. The beautiful visuals only underscore the beauty of this film, whether its from the gauzy opening shots of a boat on a river, to the jarring dream images filmed similar to a 8mm home style movie (Herzog actually confirms in the DVD film commentary that the home style movie shots were taken by his brother on a trip many years earlier, in which Herzog saved by pulling out from the family garbage); and last but not least the imaginary Caucusus mountains led by a blind man in the Sahara Desert, in which Kaspar dreams of a story with no ending. When Kaspar tells the Professor in his garden that he had never dreamed all those years imprisoned within the cellar, it was probably because he didn't have the knowledge and imagination to know what he could possibly dream about. What makes The Enigma of Kaspar Hauser such an intriguing and enriching film is Kaspar's increased intellectual development which brings into play questions of language, growth and education and how it can shape our thoughts and feelings as we grow as a person. Kaspar's sudden intellectual discoveries on 19th Century German customs has him discover just how absurd and preposterous many of them really are. For instance there is a scene in which Kaspar rejects theology, by running out of a church and describing to the Professor that the congregational singing sounded like howling, which only gotten worse for him when the preacher began howling. He also questions the absurdity of some clergymen’s claims about God creating the universe from nothingness, as well as exposing the sexism of the era when he asks a housekeeper in the home what purpose women serve by only doing household chores and not truly living. The housekeeper's ironic answer to that question for Kaspar is to ask his male employer; which is a brilliant distillation of the hypocrisy. Another great moment is when the Professor tries to explain to Kaspar that apples are not thinking creatures, and tries to prove it by rolling one down a path. When the apple instead rolls off the path and hops into the high grass Kaspar arrives at his own conclusion that the apple can think for itself, which is why it knew to not follow the Professor's wishes and instead hide in the grass. Space and size is another theme that Kaspar has a different understanding and interpretation of, such as the scene when he argues with the professor about the space and size of the room in the jail tower, and how its creator must be as large as the building he had created. My absolute favorite sequence in the film is when a Logic Professor asks him a question about two towns; one filled with constant liars and one filled with total truth tellers. However, Hauser has a more primitive logic, one that involves the question of a tree-frog. It is every bit as logical and understandable as the Logic Professor's question and yet the Logic Professor rejects it as being outside logical conventions. Not only is that question every bit as logical as the Professor's, (The Housekeeper even understood it's meaning) but it is also a much more easier concept to grasp and understand as well. Because of Kaspar's increased learning of the fundamental ways of the world he has finally started to develop his own opinions on certain subject matters, and is not only able to finally discover the cracks or 'flaws' within our system, but the selfish and arrogant flaws within human beings as well. Eventually when Kaspar seems to have been educated and civilized enough to fit in with proper society, a English Lord decides to take him in as his protege. In a interesting scene the English Lord invites Kaspar to a upper-class English ball, and when introduced to the Mayor and his wife, Kaspar becomes rude by stating negative comments like: "Nothing lives less in me than my life," and instead wants to be left alone. Kaspar seems to have falling into a form of depression as he finally sees the real world for what it is, the honest educated truth, which is harsh, unfair and cruel. (Nature, which is the one pure and innocent thing that Kaspar tends to still grasp onto even seems to get tarnished, when he can't even sow his name with cress seeds in the Professor's garden without someone walking through and destroying them.) Kaspar's negative comments to The Professor couldn't be any more true: "The people are like wolves to me." I believe Kaspar has finally realized that he really didn't miss out on as much as he believed he did when he was a prisoner in a tiny cellar for a large part of his early life. At least when he was imprisoned he was ignorant and blissful, oblivious and content. Maybe that is why Kaspar was truly content to share to everyone the caravan and the desert story while being on his deathbed, knowing fully well he didn't have an ending to the story. Kaspar not only came to the realization that most honest truths don't have a particular satisfying and fitting ending, but he accepts it, and was just as happy to still share the story, incomplete or not. In the conclusion of the film Kasper's brain is being dissected and Coroners have discovered many brain abnormalities.This of course excites and satisfies the town Registrar, who was recording the case of Hauser for the town’s records all throughout the film. He leaves the autopsy feeling that this brain abnormality is finally the explaination he has been searching for that explains Kaspar's enigma. And yet, this explanation doesn't explan or answer anything. In fact, this ironic and darkly comic ending says far more about the man and the society which created him than the real Kaspar himself, as the true identity of Kaspar will unfortunately always remain an enigma; which is in some ways a story without an ending in itself.